Welcome to the SUNY Geneseo First Response Home Page. We are a student-run, volunteer organization based at SUNY Geneseo that provides emergency medical services to the Geneseo campus community. 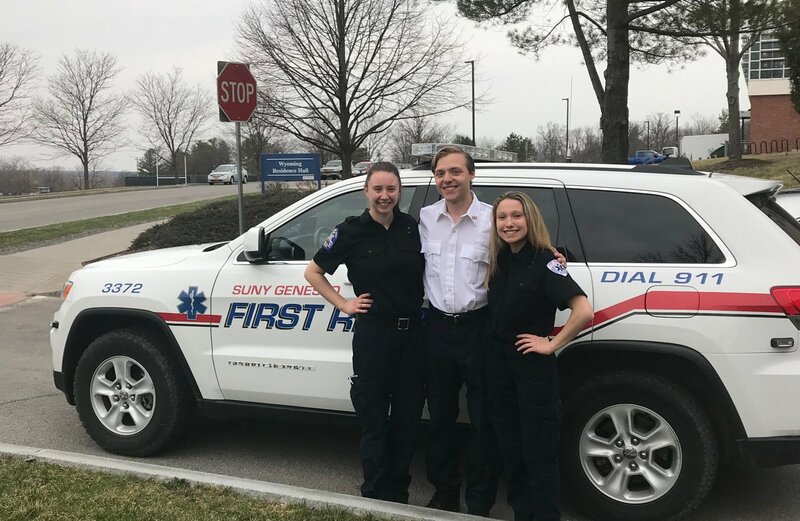 SUNY Geneseo First Response (GFR) provides emergency medical care to students, faculty, staff, and visitors of Geneseo at the Basic Life Support level. We operate 24 hours a day, seven days a week. Our crews are led by a New York state certified Emergency Medical Technician. The crew chief is responsible for all primary patient care, and oversees two attendant members trained in necessary emergency management skills. SUNY Geneseo First Response is the primary EMS agency for the SUNY Geneseo campus. We are integrated into a larger system comprised of the University Police Department, the Lauderdale Center for Student Health and Counseling and local EMS agencies; all dedicated to providing the best available care to every member of the campus community.